The Mayberries will be giving a concert in the Memorial Hall on Saturday 20th April. 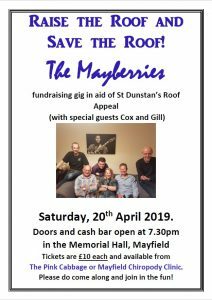 It’s a fundraising gig in aid of the St. Dunstan’s Church Roof Appeal. Door and cash bar open at 7:30pm. Tickets, priced £10, are available from Pink Cabbage and Mayfield Chiropody Clinic.